Read up on how it was done. Zepto.js, the semicolon-free edition! That’s right, we removed all trailing semicolons from the source and tests. They were never needed anyway. We’ve relaunched the ZeptoJS.com website to be a single-page documentation site—it works great on desktop browsers and as a home screen bookmark on iPads. extending or overriding Zepto functionality. We also have some more examples in the main repository, plus a completely new README describing how to build, customize and contribute to Zepto; plus fully automated testing using PhantomJS. The complete diff is here. Please do report any bugs with v1.0rc1 on the issue tracker. Don’t you just hate it when you find some great piece of code on GitHub and then you realize that somewhere at the end of the README the frightful acronym GPL is ruining your good mood? I propose to make it easier to find projects with a license you can live (and work) with, and would love to see a “license type” setting in GitHub. The license type would maybe show up as a little flag, ribbon or banner when you browse repositories on GitHub, and would also be available in the API—ideal for projects like MicroJS, where we only include permissively-licensed libraries. Here’s how that could work like—have a drop down setting on the project settings to choose from a type of license. It’s important to make the distinction that I propose to select the general type of license, not a specific license itself (like “Apache 2.0”). The project source code should still include a LICENSE file of some sort of course for the details; and if a project is dual-licensed, you’d specify the most permissive license. *I have some other adjectives for these types of licenses, which I better not mention in public. Email client that only sends and receives email once per day. An app that sets up and updates Xcode and command line developer tools automatically. Screen recording software that’s not weird. A version of pgAdmin that doesn’t look like it’s from 2001. A “keynote” app for live-“watching” Apple Keynotes, pulling content from live-blogging sites. An Android emulator/simulator that is actually usable. An app that automatically cleans up backups stored on S3 or Cloudfiles (with a server-side component and alerts if backups seem to be missing). A clean, usable and fast authorize.net front-end. An app that knows about my apps and web apps, and automatically suggests how I can connect them together (APIs, integrations, etc. ), with regular updates. And finally, Safari for Android. Once upon a time I lived a quietish life in Vienna, Austria. I cooked a lot for friends and myself. I really enjoyed it and more importantly I just knew that I’ve learned everything there is about making meals from my friends and family and from what you “just know” about cooking when growing up in Austria. But guess what? A lot of “it is done like it is done” is just outright wrong, incomplete or could be much better with little tweaks. Once I got introduced to American-style cooking by my awesome wife Amy Hoy, I’ve learned lots of new stuff and unlearned old things. I’ve come to love things that I, without questioning, considered stupid before. Even more importantly, measurement units are human-derived instead of being arbitrary set metric units. It sure is convenient to use grams in mathematical formulas, no doubt, but it’s a different story to weigh 75.6g. Just use 5 1/3 tablespoons—so much better. Note: there are many things that Europeans do better—for example the quality of raw ingredients like milk, butter, eggs, and so on is often higher than what you can (easily) get in the US. And I wish I could get my hands on Austrian bread when I’m in the US. So what this all have to do with programming? It doesn’t matter if it’s cooking or programming or doing whatever, really—you can learn from other people and how they do things differently from you. Don’t dismiss them outright. Hear what they have to say. Here’s one concrete example for myself that I’ve stumbled upon: I dismissed the meaningful indentation in Python, but later I’ve come to like it in CoffeeScript. However, if something doesn’t hold up to the claims, or is doing things objectively wrong—it’s OK to be dismissive. It’s good to be opinionated. Just think about it for a second first, and better yet try it out. You might be surprised about what you fall in love with that at first seemed outlandish or stupid to you. Coffee nerds, kill me now. Here’s a little fun diversion, snowflakes animated with Zepto.js! 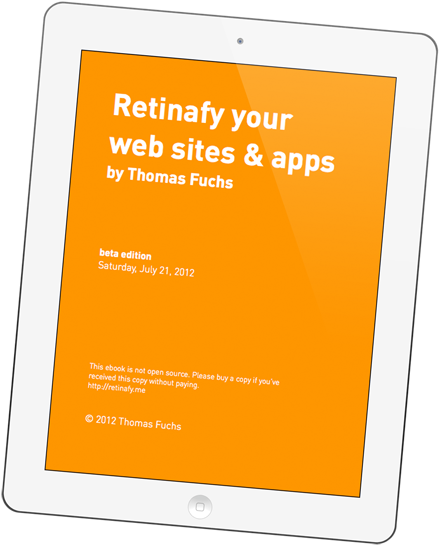 Works on WebKit-based browsers (Safari/Chrome, iPhones, iPads, Android phone, webOS-based phones, PlayBook etc. ), and Firefox, thanks to the new Firefox support in Zepto 0.8.